As their presence grows at the expense of brands, consumer backlash against supermarkets’ private label lines has intensified according to a report from research agency TNS. 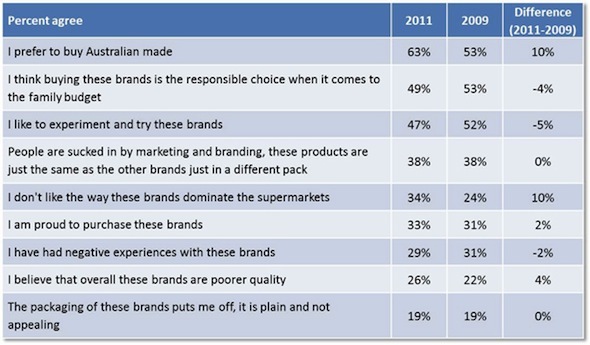 With retailers deleting branded products from their range to make way for more private label goods, dislike of how they’re ‘dominating the supermarket’ grew from 24% to 34% over the past 3 years, the survey of 1,600 grocery buyers found. Commercial director at TNS, Jonathan Sinton, says there is a growing conflict between consumer needs and supermarket strategies. “Consumers want private label brands but not at the expense of the brands they’ve always bought which is where we’re seeing the backlash come from,” Sinton says. However, the backlash is brewing not only among consumers, but among brand manufacturers also. In November, the Sydney Morning Herald reported Heinz had been forced to shut a factory and downsize two others as Coles and Woolworths squeezed its products off their shelves with their private label lines. In the same month Johnson made his comments, Woolworths announced that it would aim to double private label sales. According to Nielsen’s ‘Private Label Report 2011′, private label products currently make up a quarter of all supermarket sales and are forecast to exceed 40% of grocery spending by 2015. The report warns that Australia is following Europe’s lead where private label sales account for up to 46% in some countries. The quarterly average spend per buyer on private label goods is $202.24, an increase of $10.84 since 2009. Private label now accounts for $1 in every $4 spent on grocery products and almost one-third of packaged grocery units sold. Price sensitive groups, such as families with children and senior couples, are the most common private label buyers. But according to TNS’ report, it is not just the budget conscious who continue to fuel the growth of private label. Even those who are not under financial pressures are buying up big, purchasing private label goods at an almost identical rate to those who are budget conscious. Sinton says the ability of private label brands to capture share comes down to three factors: how closely the products replicate performance, the equity the original branded product has generated previously and the price differential between the two. 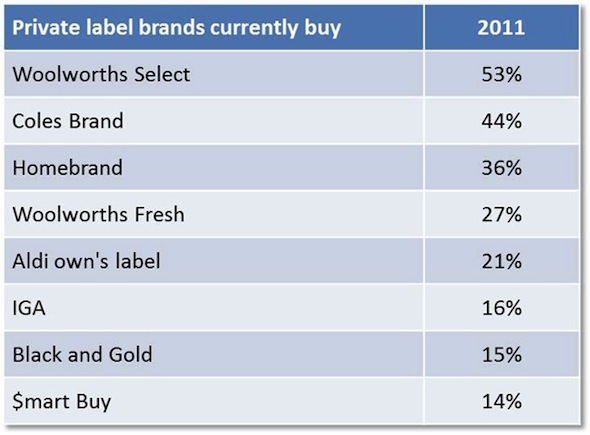 Out of the private label brands that consumers currently buy, Woolworths Select leads the charge followed by Coles Brand, Homebrand, Woolworths Fresh and Aldi brands. Nielsen’s report points out that there are different perceptions and levels of acceptance of private label across different categories. For categories with low importance and discernible difference, such as milk and household cleaners, private label is high on the list, whereas in personal care categories, such as vitamins and baby products, consumers display a reluctance towards private label. Both research agencies suggests a number of strategies for brands to hold off private label’s growth, including innovation and differentiation through aspects of variety, ingredients, quality, format and packaging, and focussing on brand by using emotion and nostalgia to build equity.